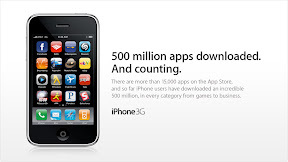 On Friday, Apple advertised that iPhone and iPod touch users have downloaded a total of 500 million apps. The half a billion mark comes 42 days after Apple announced its 300 millionth download on December 5. That means users have been downloading apps at an average rate of around 4.7 million per day. Apple also announced that there are now 15,000 applications available for download at the Apps Store.